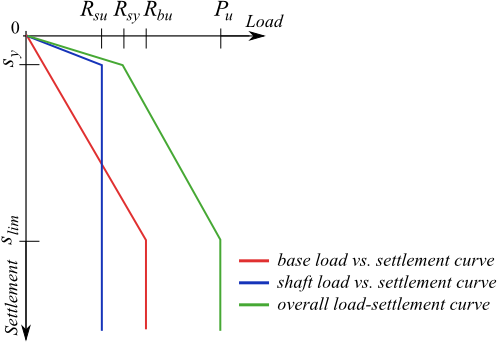 Analysis of the load-settlement curve of single pile or pile group is based on the solution described in the book Pile Foundations Analysis and Design (H. G. Poulos et. E. H. Davis, 1980) and is based on the theory of elasticity and modifications attributed to in-situ measurements. Foundation soil is therefore characterized by the modulus of elasticity E and by the Poisson's ratio ν. This method allows the construction of the load-settlement curve for pile foundations (single pile, pile group). The basic input parameters of the analysis are pile base bearing capacity Rbu and pile skin bearing capacity Rsu. Ultimate bearing capacity of pile foundation, respectively ultimate load is given by equation Pu = Rsu + Rbu. These values are obtained by the program from the analysis of vertical bearing capacity of single pile or pile group and it depends on the selected method of analysis. All partial factors of the analysis are assumed equal to 1.0 so that the resulting resistance is greater than the one obtained from actual bearing capacity analysis. During the analysis of settlement of single pile or pile group according to Poulos method (1980) program don't consider influence of additional compression of the pile shaft - that is why displacement of pile material is neglected. Poulos, H. G. et. Davis, E. H.: Pile Foundations Analysis and Design. New York: John Wiley and Sons, 1980, chapter 5, pp. 71 - 108.